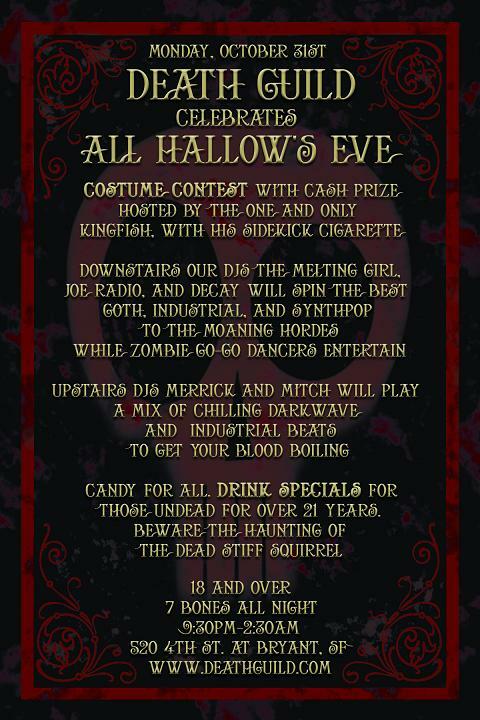 I just bought tickets online for the DNA Lounge halloween, and noticed in the fine print at the bottom that it said no cameras. That's just generic boilerplate that should be ignored, right? There are always all the photos/you talking about taking pictures/etc, so I can't imagine it's really true, but I figure it's safer to ask first. Yeah, cameras will definitely be OK on Halloween. Cameras are usually ok, but when there's a band, it's up to the band, so we don't know what they allow until they are in the building on the day of the show. I overheard the sound guy at Sigur Ros last month saying to someone "if I see any flash photography I will find you and break your legs." Which I thought was pretty awesome. I'll still be here when you're done with your job. At least there's that. I just saw Bauhaus in Seattle. It was very iffy. A startlingly short set beset by clumsy sound work, and not saved by a good (but not jaw-dropping) light design. There were highlights, but when I found I had to remind myself to be enthusiastic about it because it was likely the last time I'd see them on stage, I realized it was just plain old mediocre. However, if David J ever comes to town doing his solo stuff, don't miss it. He's really great. I'm surprised you didn't mention Negativland. Well, that's because I really seriously dislike Negativland. I'm surprised, but good to know. the THING by J. Carpenter is at Castro theater Sunday (tonite). It's the only time I have ever had the chance to see it on the big screen. Not to be missed. Seeing The Thing on opening night (yes, I'm ancient...) was a wonderful experience. Right after the first 'monster' scene, in the dog kennel, I'd say about a full third of the theater got up with shocked expressions on their faces, and left. And a friend that went with us kept making trips to the concessions. A lot. did you actually go to red elvises? i didn't see you there, but that's entirely possible through the sea of people. when are you seeing capacitor? i'd bet me and the whits would like that. LOTS. and i am entirely amused that your term for it is now FPV, too. I'd like to see capacitor as well, say when. They were amazing last time at DNA. No, missed Red Elvises. I found that I needed sushi more. I was thinking thursday for Capacitor? i think i may have needed sushi more, too. and i think you just picked the ONE day this week that i am actually free. wild. maybe i should see if the whits wants to wrangle some people so we can get that discounted group rate? any idea on the difference in cheap seats at that particular venue? hrm... that's my one free night as well. i know zak was really interested... hrm.... How much? also, fae said she was interested and free, too. Thats too bad, it was a good show. Although the opening band was like watching bad karaoke. You know, the Red Elvises are "your favorite band". I will prolly be at 242, I haven't seen them in years.